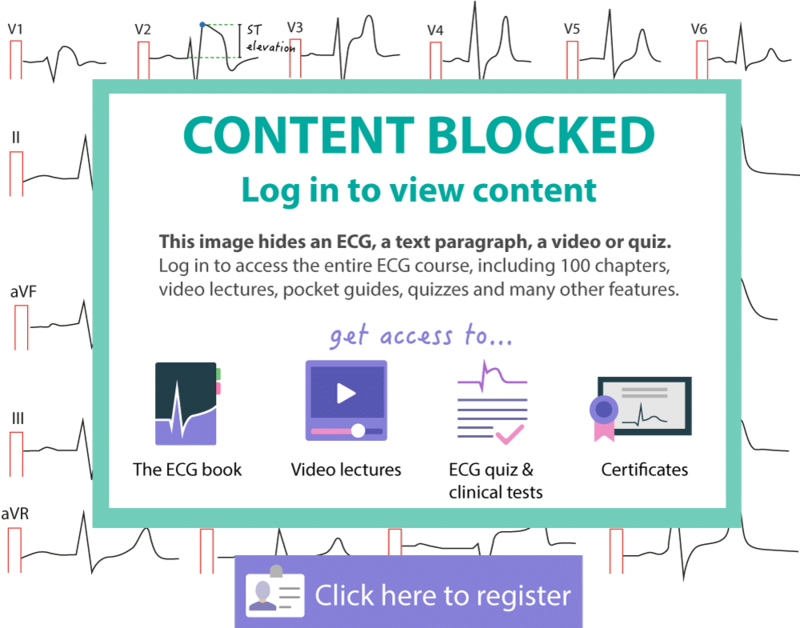 This chapter covers situations in which the 12-lead ECG does not exhibit ST segment elevations, but the condition should be managed as STEMI (ST Elevation Myocardial Infarction) in terms of treatment and interventions. As discussed previously, STEMI is the result of a complete and proximal occlusion in a coronary artery, which results in transmural myocardial ischemia. 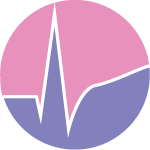 The term transmural ischemia implies that the ischemia affects all wall layers – from endocardium to epicardium – in the myocardium affected by the occlusion. Transmural ischemia yields ST segment elevations on ECG. ST elevations are the hallmark of STEMI. However, there are situations with transmural ischemia that do not yield ST elevations. It is important to recognize these situations, since they should be managed clinically as STEMI. The explanation for this is simple: transmural ischemia is due to a complete and proximal artery occlusion and such occlusions must be managed with immediate PCI (Percutaneous Coronary Angiography). Transmural ischemia located in the posterolateral portion of the left ventricle. Transmural ischemia located in the right ventricle. Both these situations do, however, yield ECG changes which indicate the underlying pathology. It is important to be aware of the characteristic ECG changes as they have implications for the management of these patients. Also note that posterolateral and right ventricular infarction may occur simultaneously (if both territories are affected by the same artery occlusion). Approximately 30% of patients with posterolateral infarction will also have right ventricular infarction; among these patients, roughly 10% have hemodynamically significant right ventricular infarction. Hemodynamic effects of right ventricular infarction include low cardiac output, hypotension, sensitivity to drugs that reduce preload (nitrates, morphine, diuretics), high-degree AV block, tricuspid regurgitation, cardiogenic shock, right ventricular free wall rupture and cardiac tamponade. The most common of these are hypotension, low cardiac output and sensitivity to drugs that reduce preload. The heart is rotated 30° to the left in thorax. This positions the basal portion of the left lateral wall posteriorly in thorax (Figure 1). This area is most frequently designated as the posterolateral wall, but it may also be referred to as the posterior wall, or the inferobasal wall. Transmural ischemia located in this area yields an injury current (ST vector) directed towards the back, where there is no exploring electrode (in the 12-lead ECG) which can present the ST segment elevations (Figure 1). Thus, the 12-lead ECG does not display ST segment elevations during posterolateral transmural ischemia. On the other hand, leads V1–V3 (occasionally V4) may detect the injury currents and present them as ST segment depressions. These depressions are reciprocal ST segment depressions, meaning that they mirror the ST segment elevations. If the terminal portion of the T-wave in V1–V3 is positive, it increases the likelihood of posterolateral ischemia. Such positive T-waves are reciprocal (mirror images) to posterolateral T-wave inversions (negative T-waves). 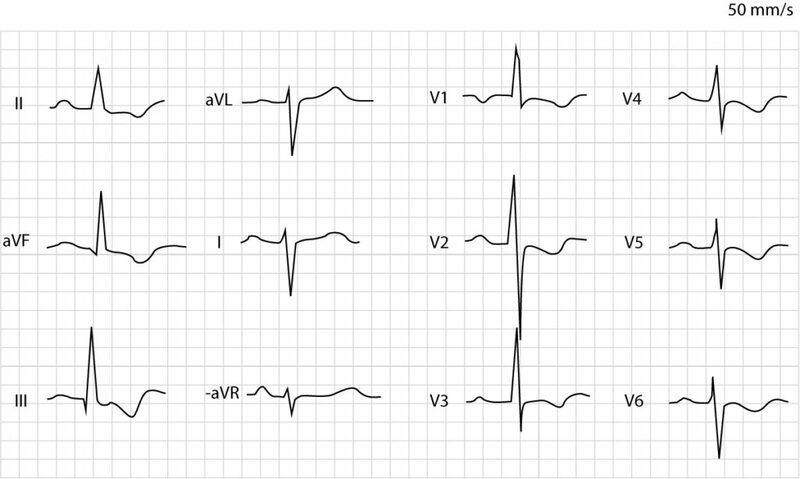 Moreover, V1–V3 may also show larger R-waves, which are reciprocal to posterolateral Q-waves. As mentioned above, posterolateral infarction may be accompanied by inferior infarction if the occlusion affects both vascular territories. This will result in ST segment elevations in II, aVF and III. Figure 1. Posterolateral (posterior, inferobasal) transmural ischemia causes reciprocal ST-segment depressions in V1–V3 (ocasionally V4). Leads V7–V9 must be placed to reveal the ST-segment elevations. 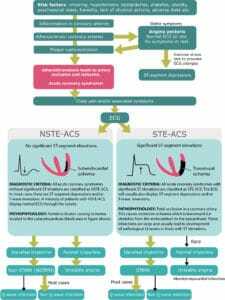 North American (AHA, ACC) and European (ESC) guidelines recommend that patients presenting with ST segment depressions in V1–V3 should be managed as patients with STE-ACS (STEMI) if there are symptoms suggestive of myocardial ischemia. 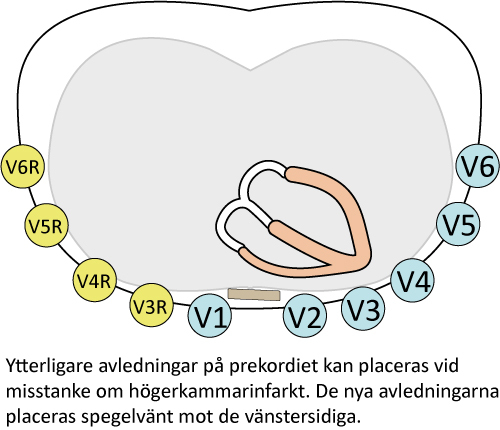 It is also recommended that leads V7, V8 and V9 be connected to the patient, as these leads may reveal the ST segment elevations on the back. In clinical practice this is often performed by simply placing the electrodes to lead V4, V5 and V6 on the back. One might wonder what the probability is that the patient actually has NSTE-ACS (NSTEMI) since they present with ST segment depressions on the 12-lead ECG (recall that ST segment depression is the hallmark of NSTE-ACS/NSTEMI). The answer is rather simple: the probability that the patient has NSTE-ACS/NSTEMI is small and the vast majority has STE-ACS/STEMI. This is explained by the fact that NSTE-ACS/NSTEMI rarely presents with ST-segment depressions exclusively in V1–V3. ST segment depressions in V1–V3 in patients with NSTE-ACS/NSTEMI are almost invariably accompanied by ST segment depressions in other leads (particularly V5) and that is not consistent with posterolateral transmural ischemia. ST-segment elevation in V7-V9: ≥0,5 mm in at least one lead (males and females). Right ventricular hypertrophy shifts the electrical axis to the right. The terminal portion of the T-wave is not positive in right ventricular hypertrophy. The ST-segment depressions have an upwards bulging ST segment in right ventricular hypertrophy, whereas the ST segment is usually horizontal or downwards bulging in ischemia. Figure 2. Right ventricular hypertrophy. The artery supplying the right ventricle is branched of proximally from the right coronary artery. It follows that a proximal occlusion in the right coronary artery may cause right ventricular infarction. This is, however, uncommon and even more rare is an occlusion in the artery supplying the right ventricle. No standard lead in the 12-lead ECG is adequate to detect right ventricular ischemia. Leads V1–V2 may appear to be able to do so but these leads primarily record electrical activity of the interventricular septum. Nevertheless, right ventricular infarction does occasionally cause ST segment elevation in lead V1 and occasionally V2. If ST-segment elevation is present in both leads, it must be higher in lead V1 for it to be consistent with right ventricular infarction. In order to capture the ST segment elevations over the right ventricle, one must use two additional leads, namely V3R and V4R. Occasionally the ST segment elevations will also be present in V5R and V6R (but elevation in these leads is not necessary for the diagnosis). Refer to Figure 3. Figure 3. Right sided chest leads in right ventricular infarction. ECG in right ventricular infarction. 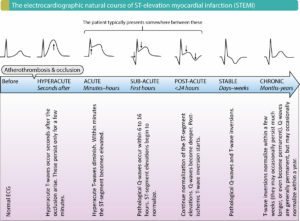 Transmural ischemia, STEMI (ST Elevation Myocardial Infarction). Suspicion of right ventricular infarction should always arise when ST segment elevations are seen in lead V1. In the vast majority of cases there will also be ST segment elevations in leads II, III and aVF (i.e there is inferior infarction as well), because the right coronary artery supplies the inferior wall in 90% of all individuals. Clinical characteristics of patients with right ventricular infarction have been discussed above. ST-segment elevation ≥0,5 mm in V3R and V4R (men and women). ST-segment elevation ≥1 mm in V3R and V4R in men aged less than 30 years. 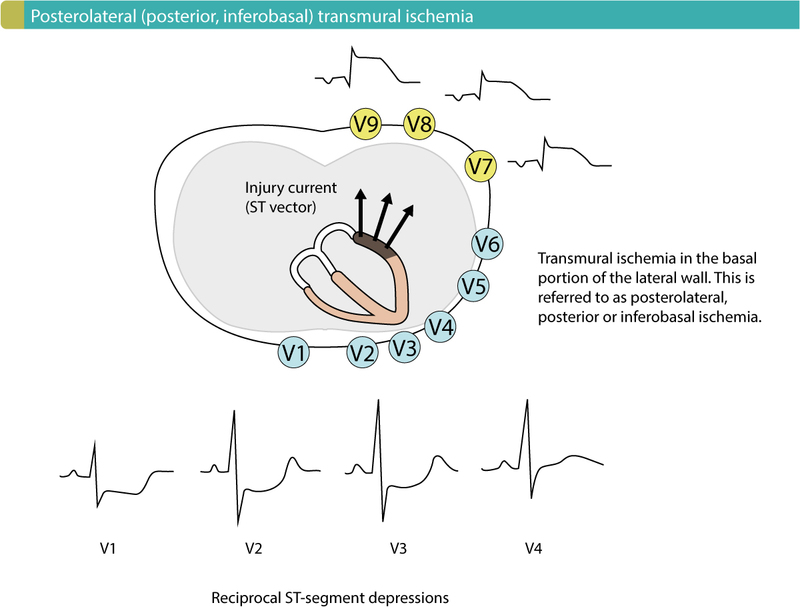 Whereas transmural ischemia located in the right ventricle or posterolateral wall of the left ventricle may avoid ST elevations on 12-lead ECG, left bundle branch block (LBBB) may both imitate and/or mask acute transmural ischemia. Moreover, studies have demonstrated that patients presenting with chest pain and left bundle branch block may benefit from acute angiography (with the intent to perform PCI). North American and European guidelines therefore recommend (2017) that patients with left bundle branch block and suspicion of acute coronary syndrome should be managed as STEMI. Assessment of ischemia is difficult in presence of left bundle branch block. This is because left bundle branch block causes marked alterations in left ventricular de- and repolarization. Left bundle branch block always causes secondary ST-T changes which may imitate and/or mask ischemia. 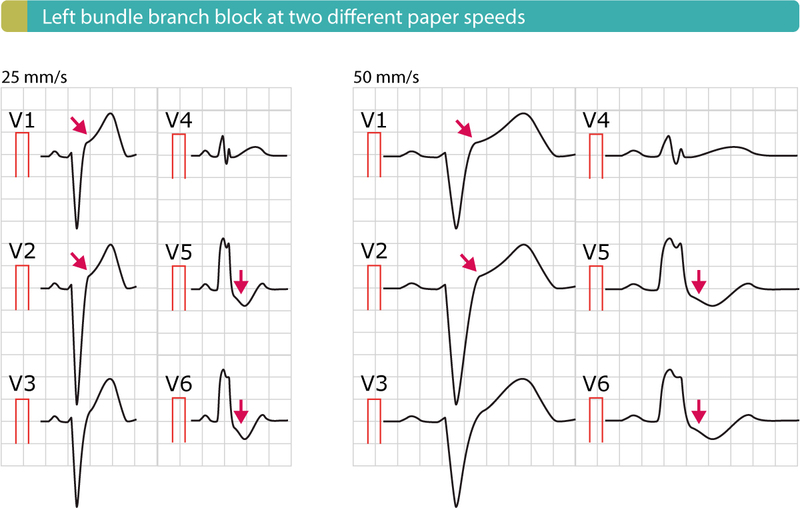 Left bundle branch block typically manifests with ST segment elevations in leads V1–V3, whereas leads V5, V6, I and aVL shows ST segment depressions (Figure 4 below). Clinicians frequently confuse these elevations and depressions with those caused by STEMI. 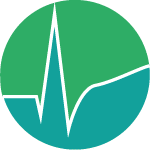 Several studies have shown that the majority of patients inappropriately referred to the catheterization laboratory (for PCI) with a suspicion of STE-ACS/STEMI actually have left bundle branch block. A significant proportion of the left bundle branch blocks are not new, but simply new to the health care system (e.g lack of previous ECG recordings). Even if the left bundle branch block is new, the occlusion may not be total, in which case PCI does not confer any survival benefit. 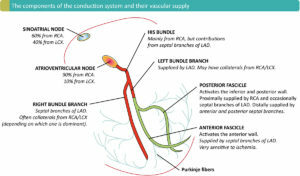 Separate chapters are devoted to ischemia interpretation in the setting of left bundle branch block (LBBB) and general aspects of left bundle branch block (LBBB). Figure 4. Left bundle branch block (LBBB) with typical ST elevations (V1–V2) and ST depressions (V5-V6).